14" x 9" leaves with 16-18 veins. 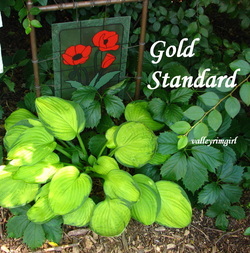 Impressive, vase-shaped mound of gold-centered, green-edged foliage with near white flowers. Spectacular specimen plant. 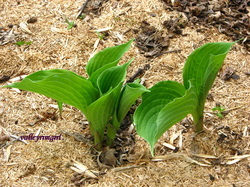 This is a new purchase as of 2008 and it will be interesting to see how the hosta matures with time. 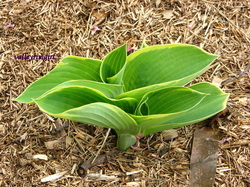 This picture was taken at the beginning of June in 2009 just as the leaves were unfurling. 6" x 2" long lance shaped dark grass-green leaves with a neat wide white edge. 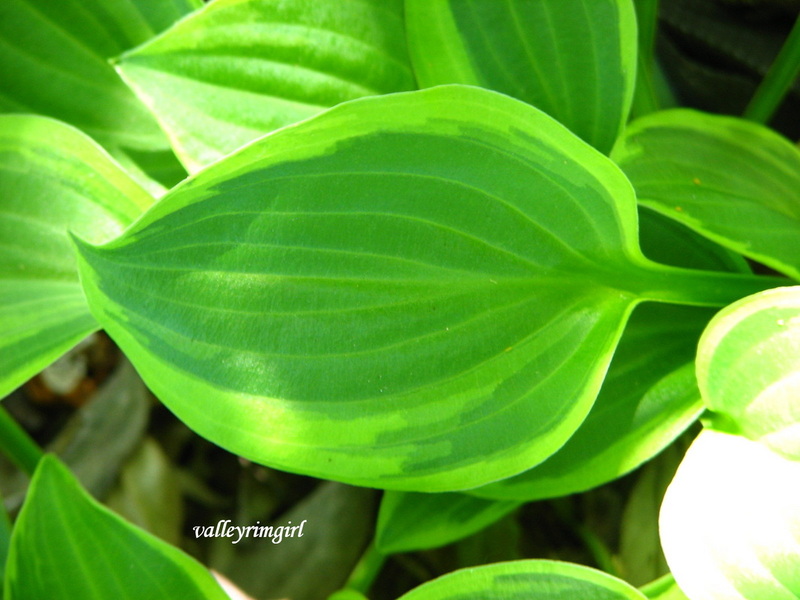 Petioles are edged in white. Some leaves may be cupped. Makes a great border plant. Blue violet flowers over a long period. Multiplies rapidly. Ginko Craig has two distinct leaf forms. 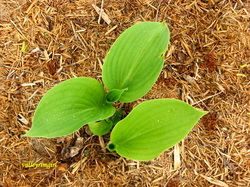 Young: uniform white edges. Mature: noticeably larger, with irregular white undulate edges. 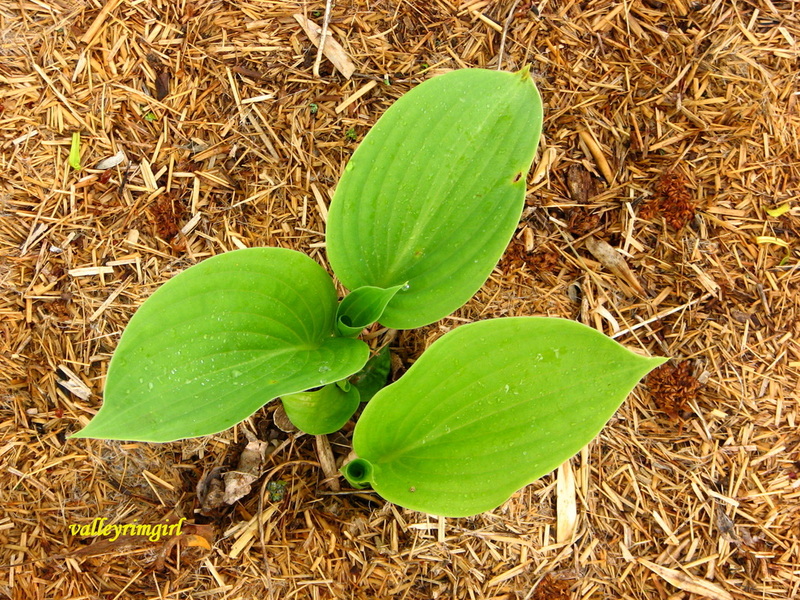 Mature leaves start to show on plants that are 4 years of age and older. Dividing your Ginko Craig will keep the young leaves and uniform edges. 8" x 5" leaves. 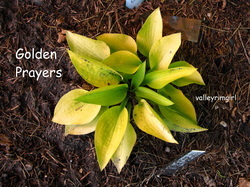 In the spring - all green leaves, summer - gold with narrow green edge, fall - centers nearly white. Lilac flowers. 7-8 vein pairs. Rapid increaser. Awards: AHS Alex J. Summers Distinguished Merit Hosta 1993, AHS Eunice Fisher Distinguished Hosta Merit Award for best large leafed hosta 1980, Midwest Gold Award 1980, Best Gold Leaf Award 1980, Best Green Hosta in a Gardens Award 1980, Best Hosta Seedling or Sport Award 1998 & 2002, Benedict Garden Performance Award of Merit 2008. 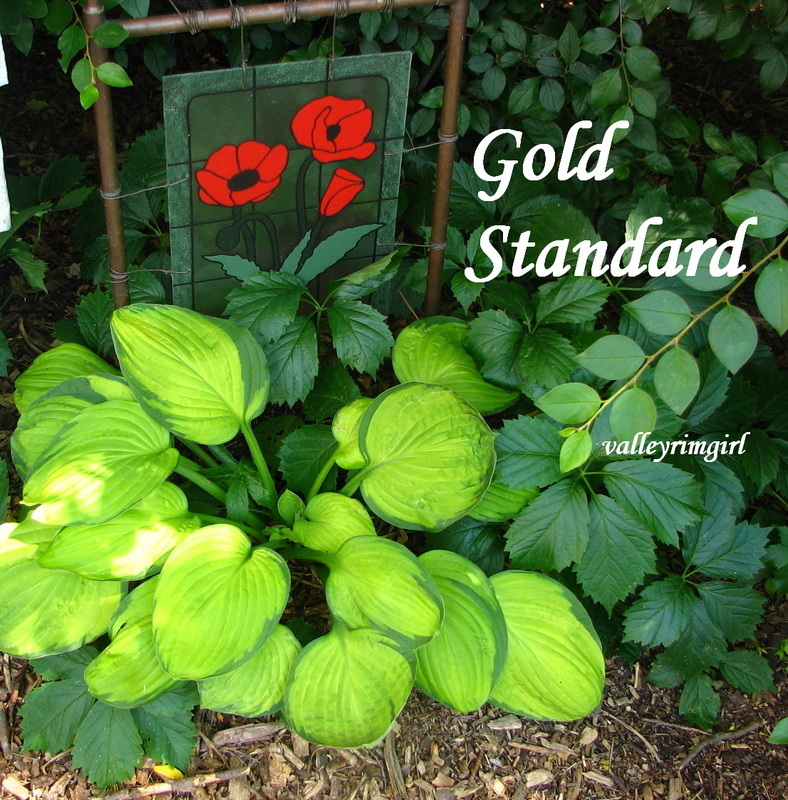 Interesting fact about Gold Standard: In 1976 a Gold Standard plant sold for $85, which was the highest price ever paid for a hosta, at that time. 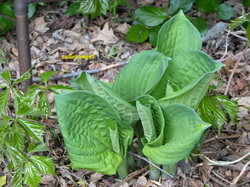 This picture was taken just as the leaves are opening up in the beginning of June. 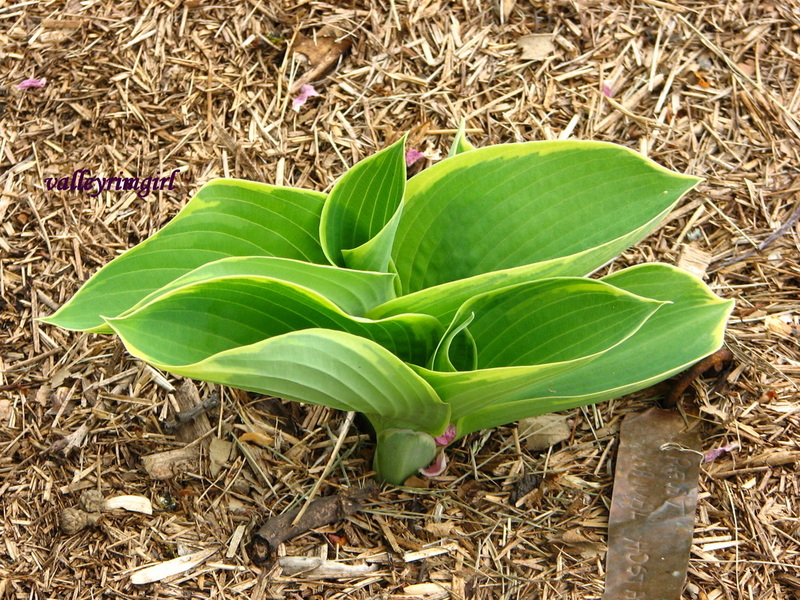 SM - Mature size 10" x 16""
4" x 3" heavy textured yellow cupped leaved hosta with an upright growing habit and near white flowers. 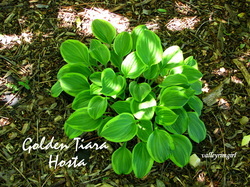 A very popular golden hosta that colors early and holds until frost and is best grown in some sun. Purchased in 2008. Picture taken mid summer 2011. 4" x 3" heart shaped olive green leaves with a chartreuse/gold edge. 6-8 vein pairs. 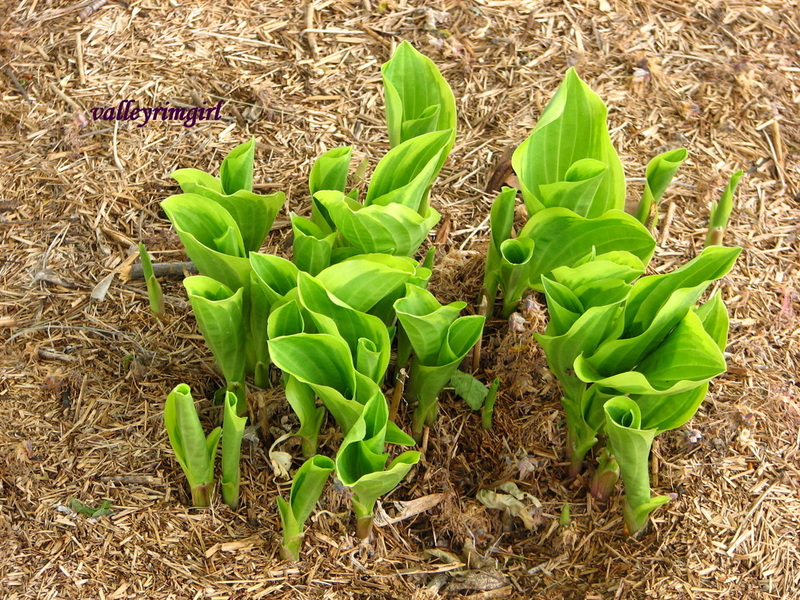 Multiplies rapidly, forming a neat compact mound. Purple striped flowers. Long bloomer. 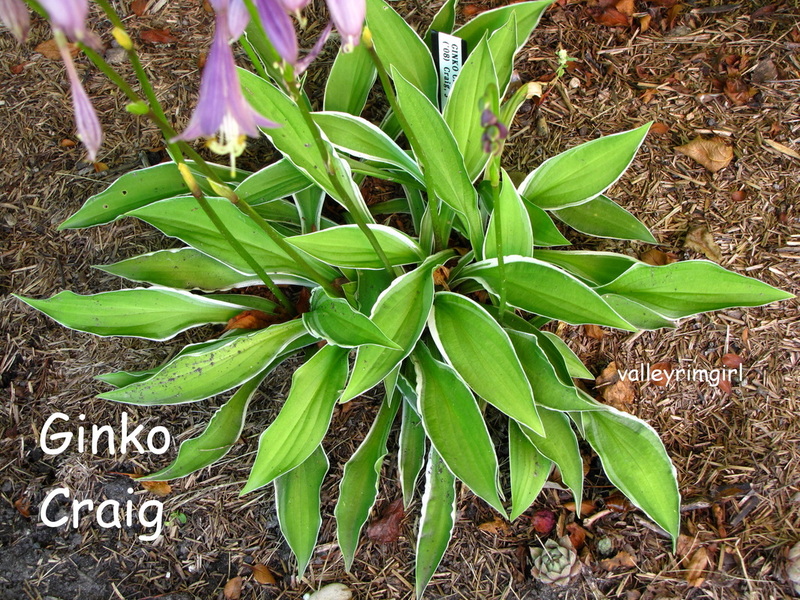 Awards: AHS Nancy Minks Award for outstanding small-leaved cultivar 1980. 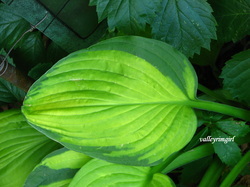 XL - Mature size 26" x 50"
13" x 10" heavily corrugated leaves with blue-green centers emerge with bright gold 1/2" - 3/4" margins which fade to creamy white by mid summer. Centers age to dark green by mid summer. 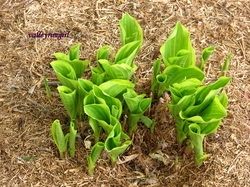 Near white flowers on 24-30" scapes. Moderately sun tolerant. 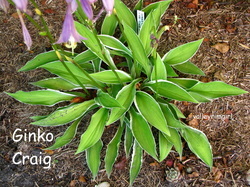 XL - Mature size 30" x 57"
Large 10" x 8", sharply-pointed medium green leaves, impressed veins, and piecrust margins are accented with pale purple white flowers. 15-16 vein pairs. Forms a large, dense and striking specimen. 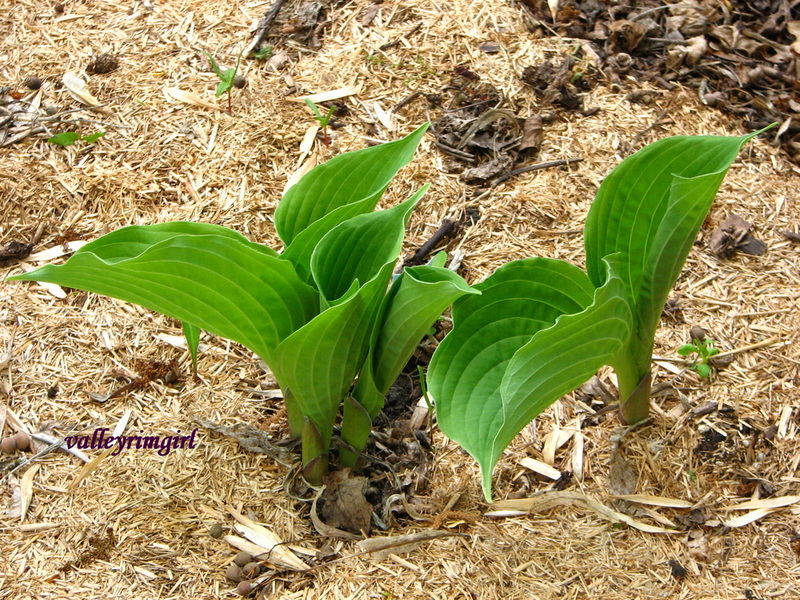 This picture was taken just as the leaves were coming up in spring.